Combine the salt, black peppercorns, white peppercorns, Szechuan peppercorns, onion flakes, garlic, mustard seeds, coriander seeds, ancho pepper and dill seeds. Fill a pepper grinder with as much of the Steak Spice as it can hold. Store remaining Steak Spice in a cool, dry space away from heat and light. To prepare the Honey Date Butter, mix the softened butter with the shallot pieces, dates, honey and sage in a bowl. Add a splash of cognac and season to taste with a pinch of nutmeg, kosher salt and black pepper. Mix and set aside at room temperature. Season buffalo steaks with the Steak Spice, pressing the seasoning into the meat. Fire up your grill to 550–650°F (290-345°C). Toast the sliced almonds over the hot fire in a dry cast iron frying pan, shaking the pan to keep them from sticking and burning. Remove once toasted and set aside, keeping warm. Grill steaks directly over the fire with the lid open for 3–4 minutes per side for rare to medium-rare doneness. After the flip, spoon a small amount of the Honey Date Butter over the steaks and brush it into the meat. Remove buffalo steaks from grill and let rest for 5 minutes, tented loosely with a sheet of aluminum foil. 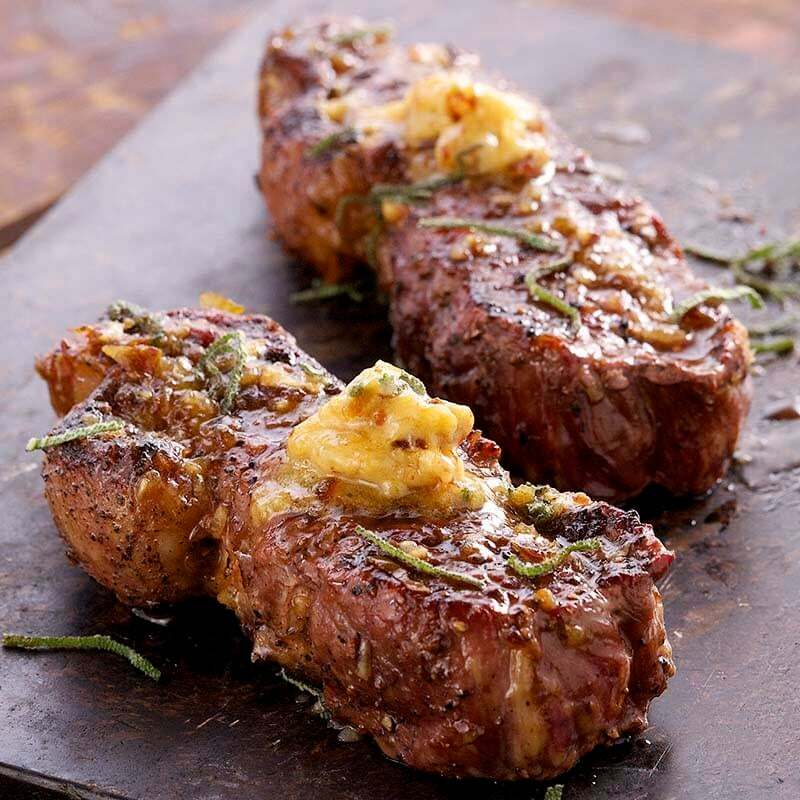 Slice the steaks on the bias and serve with a little extra dollop of Honey Date Butter. Garnish with toasted sliced almonds and a drizzle of honey. Credit: From Gastro Grilling by Ted Reader. Copyright © Ted Reader, 2014. Reprinted by permission of Penguin Canada, a division of Penguin Random House Canada Limited.